2.Make your hair keep a little wet (not dripping wet)when you use the hair chalks. 6.All colours can blend with each other. 7.Apply hair spray or hair wax to make it more natural. Wash hair with shampoo to remove colour.Use make up remove to remove from skin. Party, Halloween, Daily makeup, Stage makeup, Special effects make-up, Prom, Carnival,Festival, Cosplay and so on. ☞This set of temporary hair dye is suitable for kids and adults. 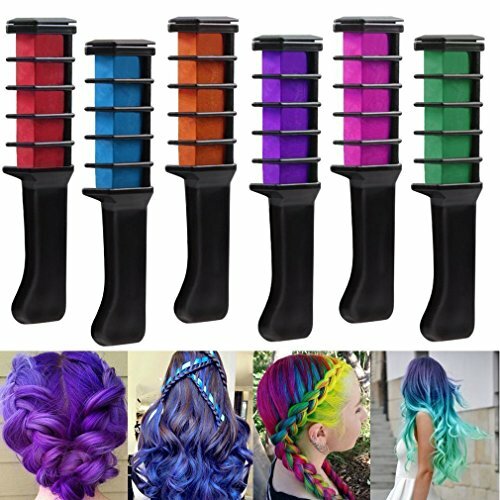 Enjoy the fun of hair chalk for costumes, dress-up or making a fashion statement. 6 Vibrant Rainbow Colors Hair Chalk :pink, red, purple, orange, green, blue. Hair Dye No need to wet your hair. You can use them individually or mix them to get your desired colors. SAFE GUARANTEE; 100% washable colour, non-toxic and safe to use on most hair types, doesn't contain any harmful chemicals. can be easily washed out with regular shampoo and water. Very easily apply to the light hair ,especially gray and blond hair. But it is a bit difficult for the dark or brown hair to apply, you can use white color firstly, and then apply to other colors you like and you can apply it for a few more times and it will be better. Hair Color Easy,Dry fast, no mess, convenient to carry and store, suitable for kids, girls, daily make-up, party, festivals, cosplay, etc. Color: pink, red, purple, orange, green, blue. If you have any questions about this product by Geeduo, contact us by completing and submitting the form below. If you are looking for a specif part number, please include it with your message.